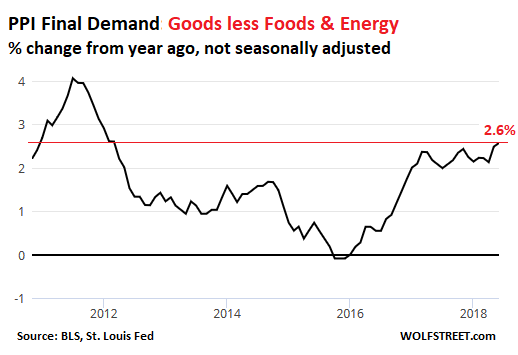 "In June, most of the rise in the index for final demand is attributable to a 0.4-percent advance in prices for final demand services," said the Bureau of Labor Statistics in the release of its Producer Price Index data. 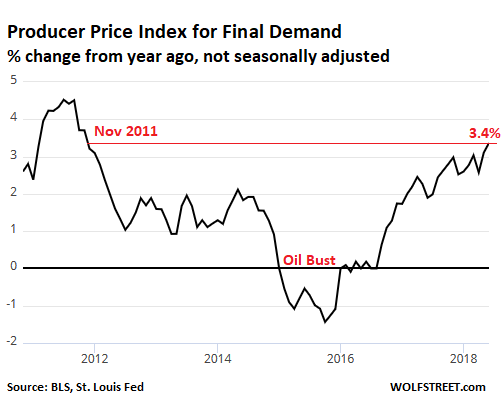 The PPI and its numerous sub-indices measure inflation further up in the pipeline before it filters through to consumer prices. Services account for 65.3% ("relative importance") of the PPI. Energy prices soared, but they account for only 5.6% of the PPI. In the overall picture, services matter the most. 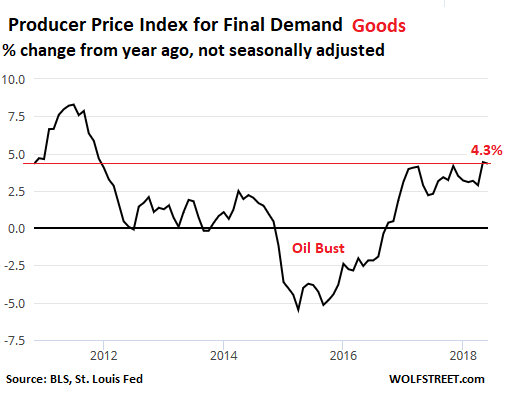 PCE price index without food and energy, the Fed's favorite: +2.0% in May. 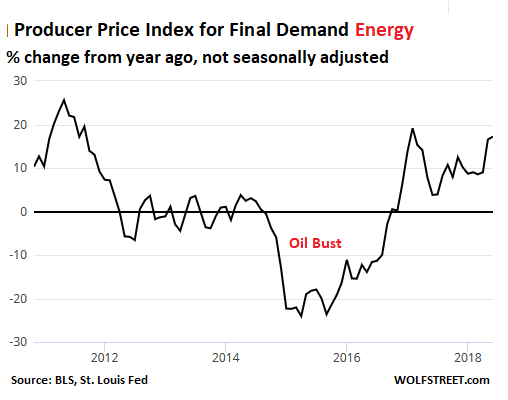 PCE price index with food and energy: +2.3% in May. Consumer Price Index: +2.8% in May; we're eagerly awaiting the June release. So inflation is on the move - and folks are wondering if it's finally the time when investing in silver makes sense again, after years of brutal punishment. Inflation "looks quite good," Chicago Fed President Charles Evans told the Wall Street Journal. 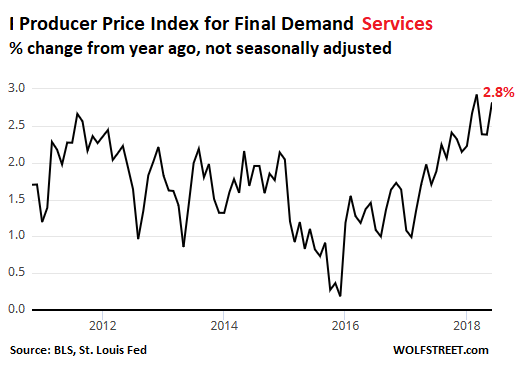 Consumer price inflation whittles down the purchasing power of labor - and for companies, the cost of labor - and only someone focused on whittling down the purchasing power of labor and the cost of labor could call rising inflation "quite good." But that's the twisted system we're in. He was one of the last remaining "doves" on the policy-setting FOMC and voted against the rate hike last December. Now, he has changed his tune. The economy is strong enough to where businesses and consumers "can live with more neutral financial interest rates," he said. "And so we're raising short-term interest rate policy in a gradual fashion, and I think the markets understand this quite well," he said. "Whether or not you think we should do it three times in 2018 or four times in 2018, it's really not going to make a big difference." That's quite a change for someone who voted against the rate hike six months ago. And where is "neutral?" In the eye of the dove, it's "100 basis points away" - so four more rate hikes to a target range of 2.75% to 3.0%, and that's just neutral. Anything above that would be tightening. Evans' idea of "neutral" for the Fed's target range will likely be reached in the first half next year. For other Fed governors, "neutral" maybe higher. Wherever "neutral" is, the higher it is, the more rate hikes it takes to get there. And when it's reached, at that point, the discussions about "tightening" commences. Interest rates are rising and are expected to rise further, and these rising interest rates have a peculiar effect. Read... "Leveraged-Loan Risks Are Piling Up."